You cannot get into the Kingdom without contact of Tour Company in Bhutan. 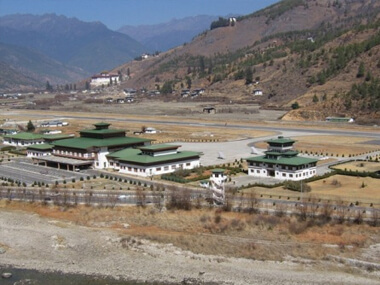 Once you land in Paro international airport, you will be honored by Bhutan Himalayan Holidays our certified guide and you will enjoy the traditional hospitality and friendship of our staff. You are also allowed to enter or exit Bhutan through surface from the border towns of Phuentsholing and Samdrup Jongkhar if you want to combine your trip to Bhutan with a visit to nearby States of West Bengal, Sikkim, and other northeastern states of India. You need Indian visa because you go into Indian Territory. From Phuentsholing to capital Thimphu the distance is 176Km, about 6hours by hired car.